As the world’s population continues to increase and new factories, builds, and residential areas spring up all over the place, the challenge of providing sufficient electric power has become a big current concern. The “solar power solution” which has received much publicity and backing from environmental enthusiasts, is becoming more popular. Solar power systems use roof solar panels to absorb the energy. The purpose of the panels is to convert solar energy into electrical power, which is sent to a control box via RS-485 serial wires. 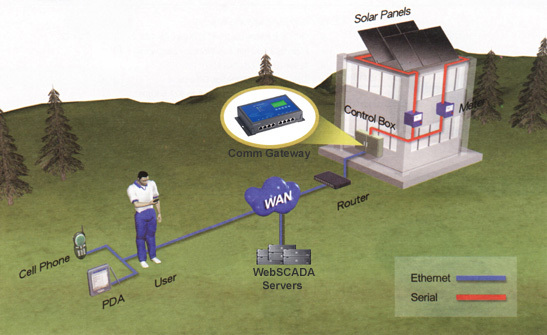 WebSCADA energy monitoring and management system offers an economical and resourceful solution to reroute serial data to an existing Ethernet network and WebSCADA servers. The solution providers can embed their own monitoring and protocol conversion software into the communication gateway to handle all power generation and consumption data, and the processed data can then be sent to WebSCADA servers securely over the Internet. As front-end controller, the gateway is compact and easy to set up. WebSCADA energy monitoring and management system also provides great flexibilities to energy providers with customizable programming options to convert all serial data received from multiple power meters to the Ethernet packet format at solar panel site. Customizable for unique industrial applications such as oil and gas utilities, manufacturing, traffic control, security monitor, scientific and engineering lab, etc.